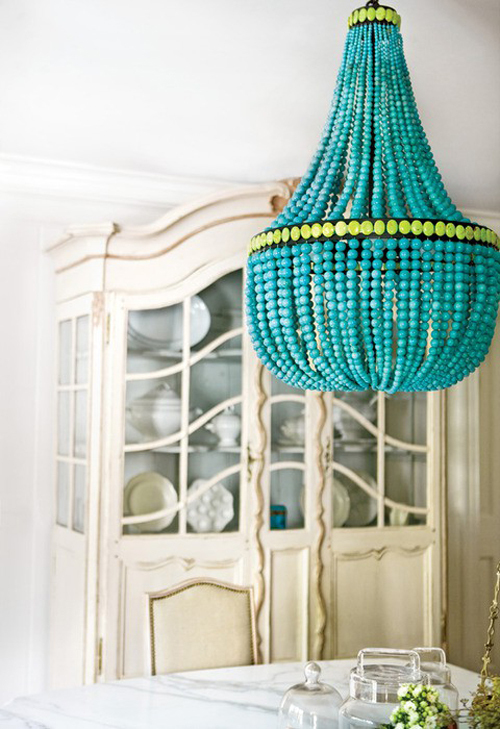 This unusual turquoise chandelier is made from semi-precious stones. The chandelier is from Marjorie Skouras Design. Happy weekend everyone! Oh my goodness, its gorgeous! Fantastic colour. That’s a really cool focal point for the room! A first seeing something like this! so nice!!! such a great find!!!!! Stop it! That is so gorgeous!! to DIE for! only i would have skipped the little green pastilles. WOW ! That makes quite a bold statement. In my favorite colour. Never seen anything like it…. can be quite overwhelming but very striking still ! ‘Loved it so much that I shared it (and your blog) this week in Elle Decor’s Design Insider’s Weekly Finds. Thanks for sharing!